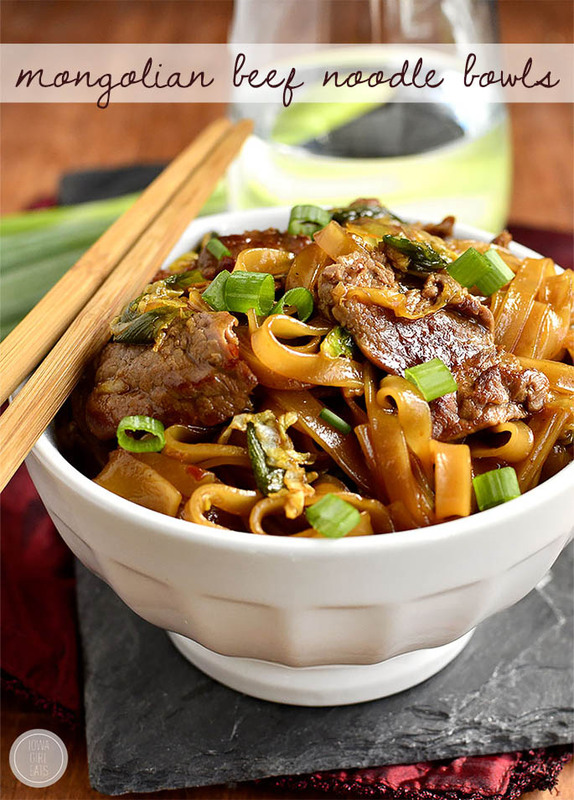 Potsticker Noodles Bowls are a take-out fake-out recipe that taste just like potstickers! Prep and cook this mouthwatering, gluten-free dinner recipe in under 30 minutes. The very first time I had a potsticker was in Japan, where they’re called gyoza, when I was 19 and spending the summer as a camp counselor on a military base near Tokyo (Camp Adventure, hollar!) It was love at first bite and I liked them so much that I came home resembling a gyoza – short and plump! That is to say, I ate gyoza like five times a week that summer and was so happy to learn the recipe was easy, and called potstickers here in the states, when I started going through withdrawals after returning home. My Mom got hooked on gyoza when we went back to the land of the rising sun for my college graduation trip, and from that point on we’d get together in one of our kitchens three or four times a year to make giant batches of them for our freezers so we could pull a few out anytime a craving hit. The fun was over, or so I thought, when I got diagnosed with Celiac Disease, as wonton wrappers are made with wheat flour (and homemade GF wonton wrappers are a son of a gun to make,) though I’m thrilled to find a work around with these Potsticker Noodle Bowls. What the heck took me so long?! The answer to my dilemma was right in front of my face, or rather, in my pantry. 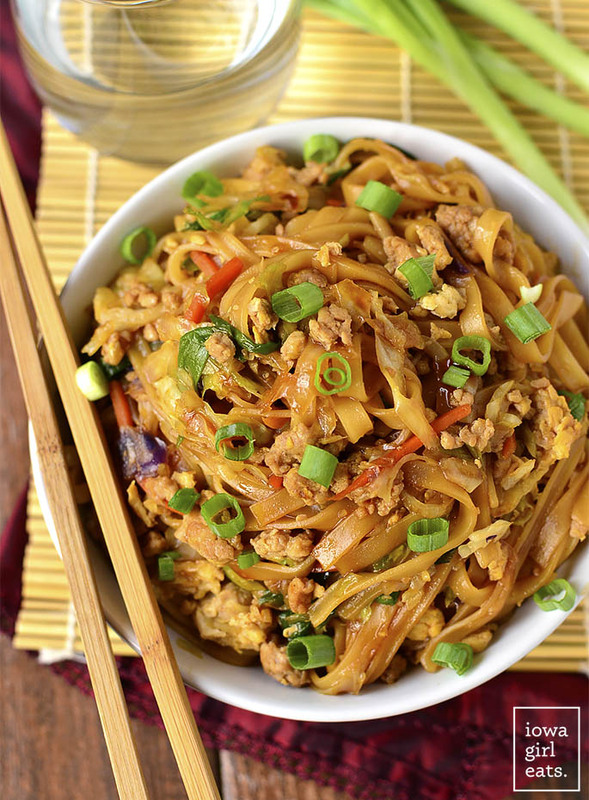 Swap wonton wrappers for gluten-free rice noodles, of course! Sure, you don’t get those famous sizzling potsticker bottoms, but what you do get is a giant bowl of chewy noodles that tastes exactly the same. You know what I’m thinking? Potsticker Noodle Bowls are a cinch to make and come together in 30 minutes with, like, 8 minutes of active cooking time. If you’ve ever made homemade potstickers than you know this is a definite upgrade. Instead of filling and folding and crimping dozens of potstickers, you get to throw all the ingredients into a wok or skillet and call it a day. Or rather, dinner. 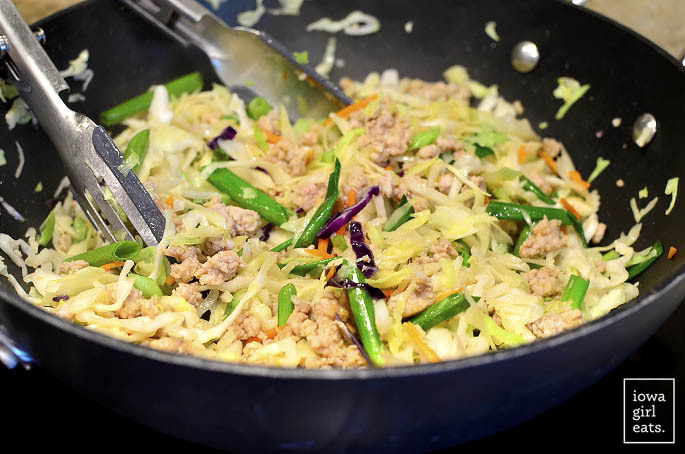 Not only are Potsticker Noodle Bowls quick and easy, they’re packed with lean ground pork, eggs, and an entire bag of pre-made coleslaw mix (hello cruciferous vegetables!) so I felt awesome serving it not only to Ben and myself, but Lincoln too. Your family’s going to love it! One last thing before you start scrolling – be SURE to use low-sodium gluten-free Tamari (or low-sodium soy sauce if you don’t need to eat gluten-free) in this recipe versus regular. The first time I made it I used regular and the dish was beyond salty. I don’t recommend cutting regular tamari or soy sauce with water to make low-sodium as you’ll dilute the wonderfully rich flavor of the sauce. Pick up low-sodium and you’ll be set! Start by soaking 8oz gluten-free rice noodles according to package directions – usually they take between 20 and 30 minutes. 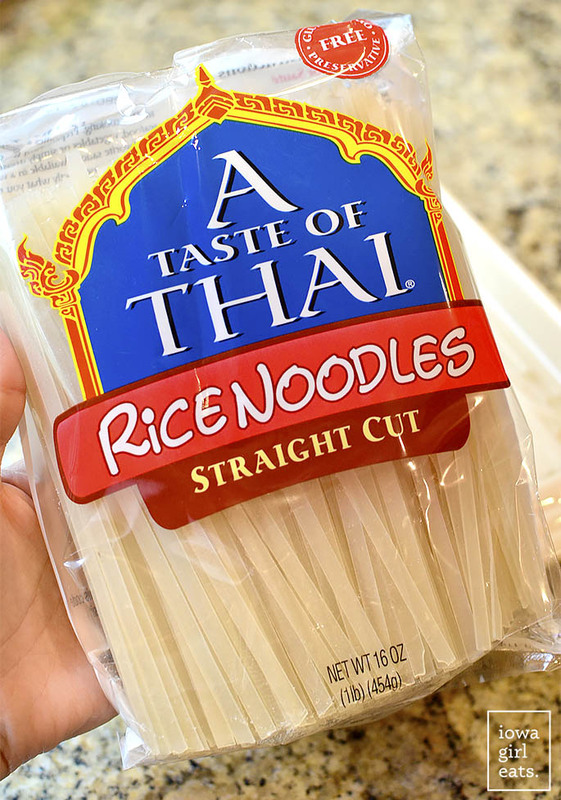 I always have great luck with A Taste of Thai straight cut rice noodles which can be found in the regular Asian foods aisle at the grocery store. Just add them to a dish, cover with really hot tap water, give ’em a stir, then let ’em soak. While the noodles are soaking, mix together 1lb ground pork with 1 Tablespoon low-sodium gluten-free Tamari (could use soy sauce but again, dish will not be GF) in a bowl. When the noodles have 5 minutes left to soak, it’s time to start cooking. 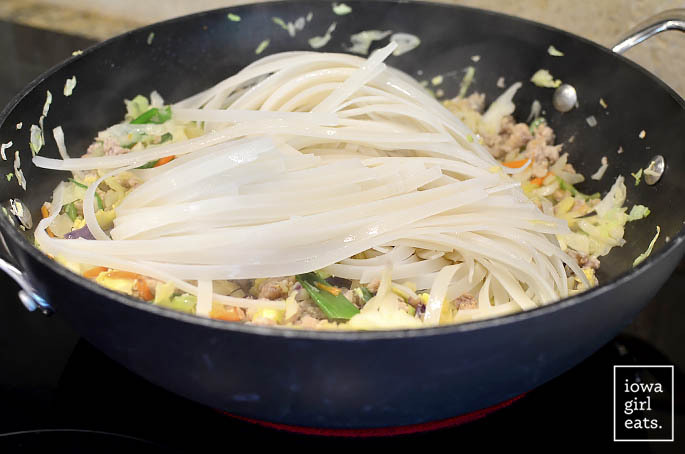 Heat 1 Tablespoon high heat cooking oil in a large, nonstick wok or 12″+ skillet over high heat then add the pork, season with white pepper, and stir fry until the meat is cooked through, breaking it up as it cooks. White pepper is used a lot in Asian cooking and it’s got a nice, even heat. Ben uses it in all his meat rubs too – it’s really got fantastic flavor. Next add a 14oz bag coleslaw mix and 7 green onions that have been chopped on the diagonal then stir fry until the cabbage begins to wilt, about 1 minute. Add 2 minced garlic cloves then stir fry for 30 more seconds. Next push all the ingredients to the side of the wok to make a well in the center, pour in 2 whisked eggs then scramble, and then toss everything together to combine. Last step is to drain then add the soaked rice noodles, and then stir fry for 1 minute. Add the sauce – 1/2 cup + 2 Tablespoons low-sodium Tamari, 1/4 cup chicken broth, 2 teaspoons rice vinegar, 1/2 teaspoon freshly grated ginger, and a pinch of red chili pepper flakes stirred together – then stir fry until the noodles have softened, 3-4 minutes. Taste then add a splash of water or chicken broth if it’s too salty for your tastes. Pull the stir fry off the heat then scoop into bowls and serve. I prefer to let my noodle bowls cool for 5 minutes before digging in, as you can taste everything so much better when the temperature comes down a bit, but I obviously understand if you want to face plant right away (been there!) However you go about it – enjoy! Potsticker Noodles Bowls are a gluten-free take-out fake-out recipe that tastes just like potstickers! Prep and cook in under 30 minutes. 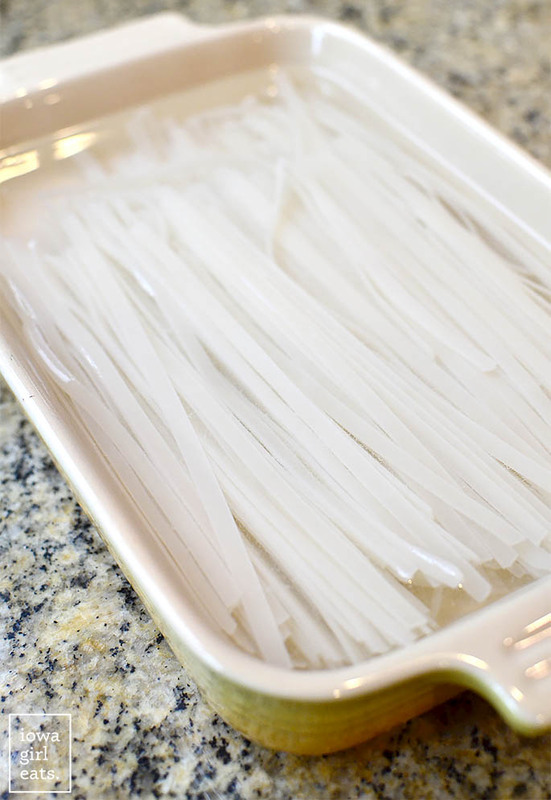 Soak rice noodles according to package directions. Meanwhile, whisk together 1/2 cup + 2 Tablespoons Tamari or soy sauce, chicken broth, rice vinegar, ginger, and red chili pepper flakes in a small bowl then set aside. Whisk together eggs in a small dish then set aside. 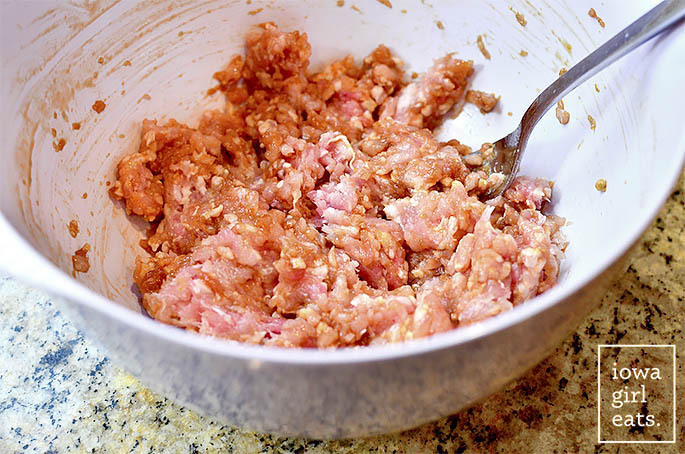 Mix pork with remaining 1 Tablespoon Tamari or soy sauce in a bowl then set aside. 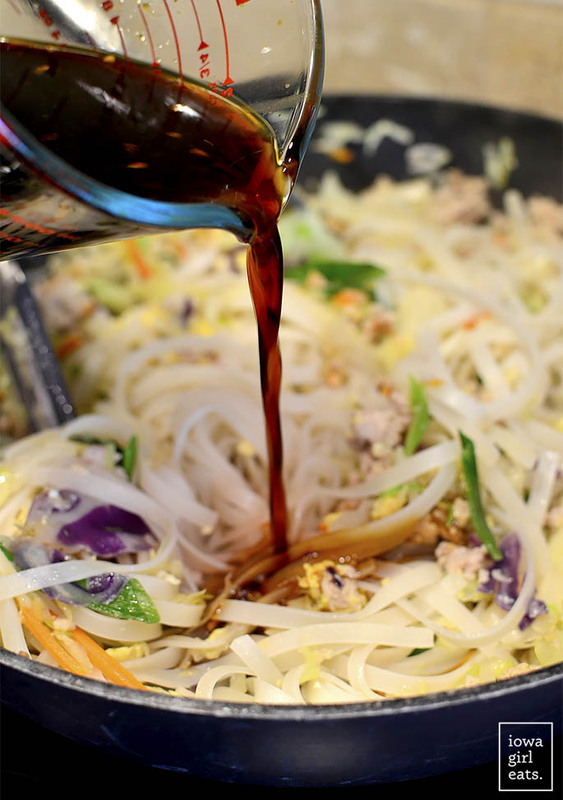 When noodles have 5 minutes left to soak, heat oil in a large, nonstick wok or 12"+ skillet over high heat. Add pork then season with white pepper and stir fry until cooked through, breaking it up as it cooks. Add coleslaw mix and green onions then stir fry until coleslaw is just beginning to wilt, 1 minute. Add garlic then stir fry for 30 seconds. 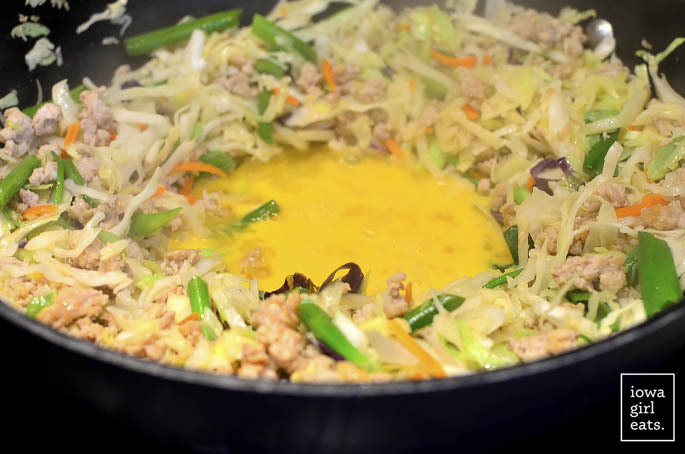 Make a well in the center of the wok or skillet then add eggs and scramble, and then toss stir fry together to combine. Drain noodles then add to the wok and stir fry for 1 minute. Add sauce then stir fry until noodles are tender, 3-4 minutes, turning heat down slightly if sauce begins to evaporate before the noodles soften. Taste then add a splash of water or broth if noodles are too salty. Scoop into bowls or plates then serve. 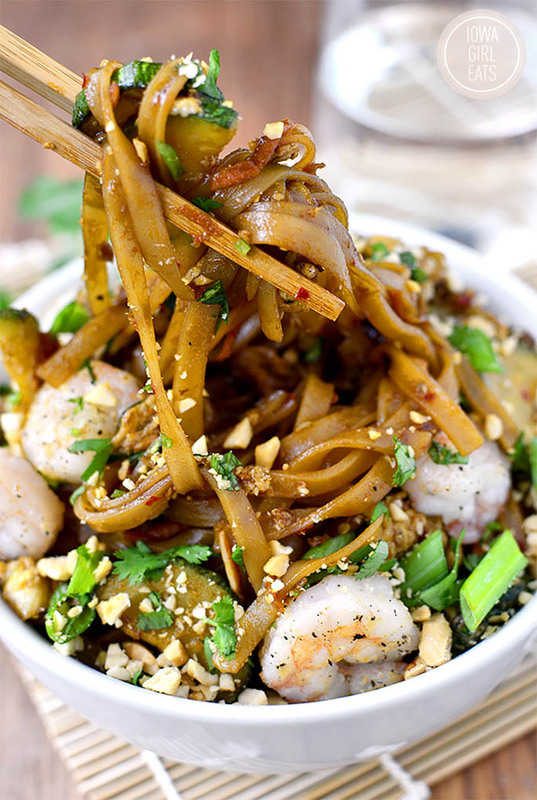 I use A Taste of Thai straight-cut gluten-free rice noodles for this recipe. As always, be sure to double check packaging to ensure products are gluten-free where and when you buy them. This is exactly what I have been craving. It looks so good. Hello dinner! This looks great, I can’t wait to try it. I’ve made your Asian noodle bowls more times than I can count, the first time I made it it was too salty for us, since then I’ve been making the recipe with half low sodium tamarin and half coconut aminos which are much lower in sodium, I think they are gf, but check for yourself as we are not gf. This looks heavenly! Making this will bring back memories of our trip to Japan! Just need that custard we had to finish the meal! Is it bad that I just said to myself “I wish I had that for breakfast”? Looks so good. As soon as I read this post I added it to my meal plan for next week. This. must. happen. Thank you so much for this recipe. I can’t wait to try it! I loved pot stickers too and have really missed them. 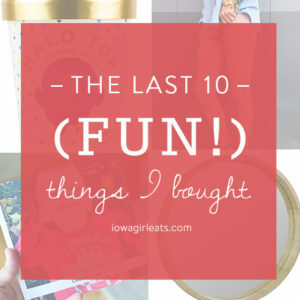 I got over a lot of foods – but I could never get over potstickers! I didn’t know there was anyone that loved potstickers as much as me!? Can not WAIT to try this! We have had your sushi bowls practically every week since you posted them and I have a feeling this bowl will be added to the weekly rotation as well!! So glad to hear, Brittany! I eat those sushi bowls all the time too! Yum! This looks delicious! You can’t go wrong with pot stickers. I bet it would be great as leftovers the next day too. I love potstickers, too. I am excited to try this recipe. Thanks for adding a photo of the noodles you use. This looks delicious! I can’t wait to try it. One question though- I’m allergic to soy so would you suggest I leave out the Tamari/Soy Sauce completely or substitute it with something else? I would use Coconut Aminos instead. The noodles will have a little sweetness to them, but I think that would actually taste great! Sounds like maybe they’re too chewy? If that’s the case you’re probably letting them soak too long. They’re still very al dente when you drain them from the soaking water, then will soften in the wok with the sauce. Let me know! Oh YUM this looks so good! I love the color. Looks amazing. 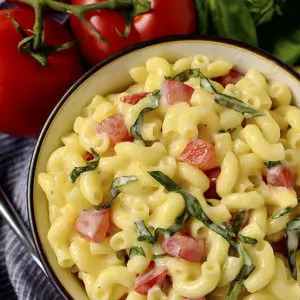 Do you think this would be good with zucchini noodles? Totally! I’d cut the sauce recipe in half or even quarter it then just drizzle over when the zoodles are nearly cooked through. This looks amazing! You have been killing it with the recipes this summer! This looks amazing! My dietary thing is low sodium, so even lo-so soy/tamari is too salty for me – my solution is raw coconut aminos! It is delicious and works perfectly as a substitute! This will hit the menu plan for next week for sure! For sure! It will add a touch of sweetness to this recipe, but I think that would actually be a nice addition! This is such a cool idea, and looks so delicious! Mouth. watering. 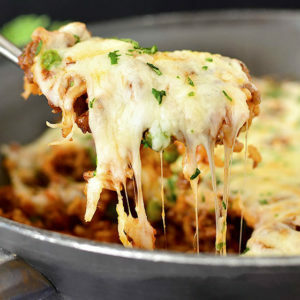 Definitely adding this to my menu soon! Just an FYI…I saw Kikkoman Gluten Free Soy Sauce for sale at WalMart last week! YES! CANNOT WAIT TO MAKE!!! This looks fantastic. I have a QUESTION though. My adult niece, like you, has Celiac disease. She missing Chinese food so much (along with bread!!!). She is single so making a whole recipe might go to waste. I’ve not worked/cooked rice noodles. Could the recipe be divided and frozen?? I can totally relate! 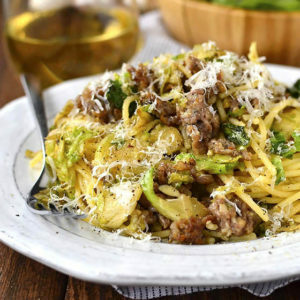 This recipe isn’t extremely freezer-friendly – I tend to think the noodles would turn to mush – but would be just fine to halve or even quarter. We moved back to the states from Japan last year and miss Japan (especially the food) so much! My husband was stationed at Yokosuka and my kiddos LOVED the camp adventure staff. They were so much fun, my kids still talk about their swim lessons! Cant wait to try this. Awww, definitely made a couple trips to Yokosuka! I was at Camp Zama, right outside the Sobudaimae train station. Still miss it almost 15 years later! OMG this looks amazing!!! I think I know what’s on the menu this weekend. This looks so good we are having it tonight, and praying that the three year old will at least try it. I was wondering how the leftovers hold up. I’m hoping it will be a Not Sad Desk Lunch for me tomorrow. Hahaha! My 3 YO ate it up – I just cut the noodles really small for him! HyVee brand soy sauce is actually gluten free! It’s been the go to brand in our Celiac home. Thanks for a great dinner idea! Just made it and I’m eating right now, so good? It’s a keeper! Thanks for a great dinner idea! Just made it (with turkey) and I’m eating right now, so good? It’s a keeper! Maybe pinch of sugar would be a nice addition? Thx? I was thinking the same thing! 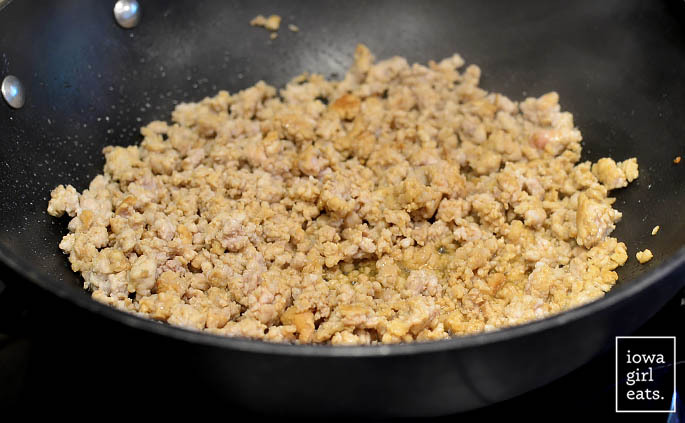 Also, we used ground chicken and it worked really well. i thought a little sweetness would just put it over the top too!! 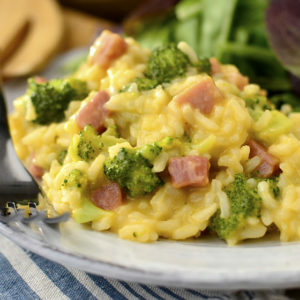 what a great, inexpensive, quick, easy, tasty meal!!! This recipe is legit! Made it for dinner tonight and it was great. Awesome! Thanks for the feedback, Jeremy! 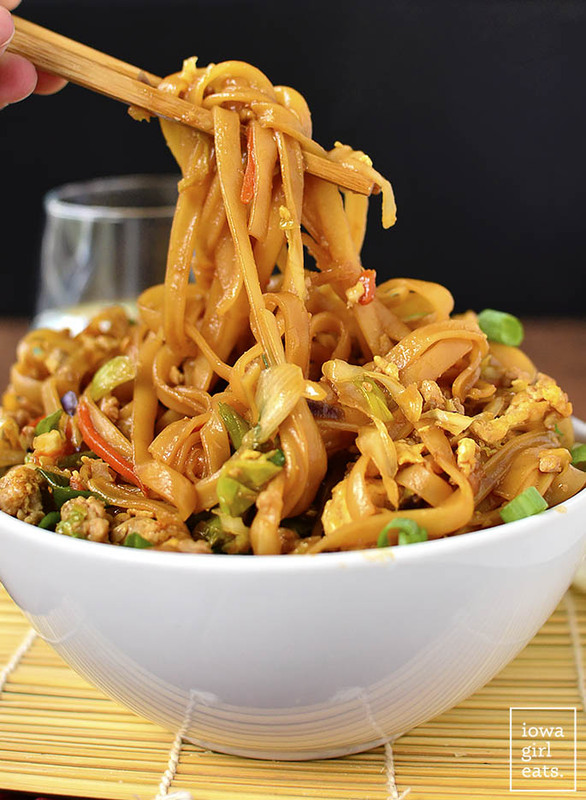 Question: if I dont need the recipe to be GF, would you still suggest rice noodles or would another type of noodle taste better? Nope, I would still recommend rice noodles – they’re awesome! Made this last night and it was very good but even with low sodium Tamari, it was a tad salty for us. Would you cut back on the amount used next time? I would add a splash of water or chicken broth next time at the end! 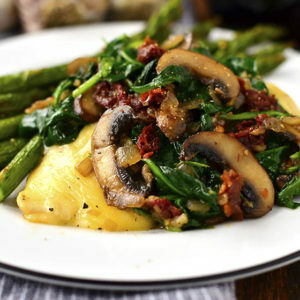 Looks great – I’m going to try and make it vegetarian w/ mushrooms instead of pork. But love the whole idea and interested in trying the rice noodles. Do you think I’d need to adjust the sauce/seasoning or anything? I might leave out the Tablespoon of tamari used to season the pork, and just use salt and pepper instead! Made the Potsticker Noodle Bowls the other night, it was amazing! Thank you for all the recipes, especially the gluten and dairy free. So helpful and fun. I think next time I make the Potsticker recipe, I will switch out the ground pork for turkey. Trying to keep the calorie count low. Thanks again, love your posts. We tried these last night and they were wonderful. We love potstickers and this dish tasted pretty close to the real deal and much more filling. Great recipe. So glad to hear it, Jenni! Yes, it’s nice to make a meal of those flavors, right? I doubled this for my family of 8 tonight (my 6 kids are ages 3-9), and they loved it. Nothing left, and they’ve asked for it to go into the regular rotation. I forgot to get the cabbage so I used shredded carrots. For my portion I used zucchini noodles bc I can’t have any grains at all, including rice. It was very tasty. Thanks. That’s a great swap, April! I’m so glad everyone loved the dish! OMG, this was amazing! I’m not a big fan of pot stickers, but something about this recipe called out to me. It was so good, I burned my mouth eating it out of the pan, then proceeded to wolf down two servings, and then eat the leftovers for my next few meals. I hadn’t even finished my first bowl, before I took a quick break to forward this recipe to my family. Hit it out of the park! I made this tonight, my twins are 5 and diagnosed with Celiac recently. (I’ve been missing the heck out of potstickers!) We thought it was good, I followed the recipe exactly, except used broccoli slaw from Trader Joes instead of Cole Slaw. I felt like it was missing something in the flavor… and the color was definitely way more pale than this pic. Do you think the broccoli absorbed the sauce more than cabbage would? (I don’t even see cabbage in your pretty pics here, I’m guessing the food was styled at least a little.) We ended up adding some honey to it and everyone enjoyed it more that way, otherwise all ingredients mimicked yours and were fresh, and ideas would be appreciated. Not to be happy you have Celiac, but I followed you for a long time and then stopped as I was overwhelmed a while back with twins, etc. But when googling for GF meal ideas, I was so excited to come across your posts and felt comforted that you have Celiac and make such great food- I know I can trust your recipes. So, sorry you have had to make this crazy adjustment for Celiac disease, but it is probably a win for those of us in the same boat! (I am GF now in support of and to be safe for my kids). 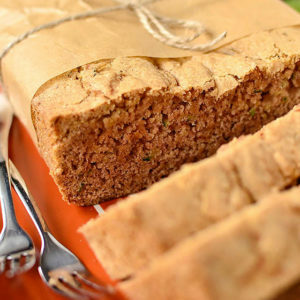 I am glad you have tackled this challenge and are creating great recipes that are gluten free! Hi Jacquie! I’m so sorry to hear about your twins’ diagnosis, though I am glad you are finding safe recipes that work for your entire family here on the site! Broccoli would need more liquid to absorb and soften versus cabbage which wilts just from the heat of the wok, so that might be why your dish was a little lighter in color/on the dry side. Let me know if you guys ever have any recipe requests and I’d be happy to tackle them – I know what it’s like to miss out on your favorite foods! I, too, love potstickers! Made this for myself today and it was so, so good. I’ll be taking it to work for lunch the rest of the week. Thanks for another great recipe! Thank you so much for the feedback, Ann – I’m so glad you tried and loved the recipe! I was so excited to try this recipe. The photos are amazing. Unfortunately, we found it to be just OK. The flavor was lacking. It just tasted like rice noodles tossed in soy sauce. Not sure what to add for more depth. Someone above suggested maybe sugar. Maybe? Anyway, just wanted to let you know. I’ve loved many of your previous recipes and I enjoy your blog! I’m sorry to hear that, LeeAnne! I like my pot stickers really plain and wanted the recipe to taste different than my Asian Noodle Bowls (which includes a bit of sweetener,) but if you want to give the sauce a little more depth, you could definitely add a drizzle of honey and/or add more rice vinegar or fresh lime juice. I hope the next recipe you try is more to your liking! I’m so sorry to hear about your diagnosis, but am glad the site and recipes can be a resource for you during this tough transitional time! If you have any recipe requests for food you are missing, let me know!! Thanks for the recipe! We loved it!! Used ground turkey instead of pork. It’s a keeper. Gonna try it with shrimp next time. Yum! I think shrimp would be awesome – I’m so glad you liked it, Denise! I made this recipe for my lunch today, using ground turkey, because that is what I had in the fridge. It was so delicious and I don’t think anyone would know that it wasn’t ground pork. Thanks for sharing, this is going to be a dish I will make over and over! Thanks for letting us know how it turned out with turkey, Amanda! So glad you enjoyed the recipe! This looks awesome! My wife and I love Asian food!! I’ll make it for tomorrow’s dinner. Thanks for the recipe. Can’t wait to try it! I made this for dinner tonight and it was SO good. My husband loved it as well and was shocked I actually cooked dinner. (Haha). 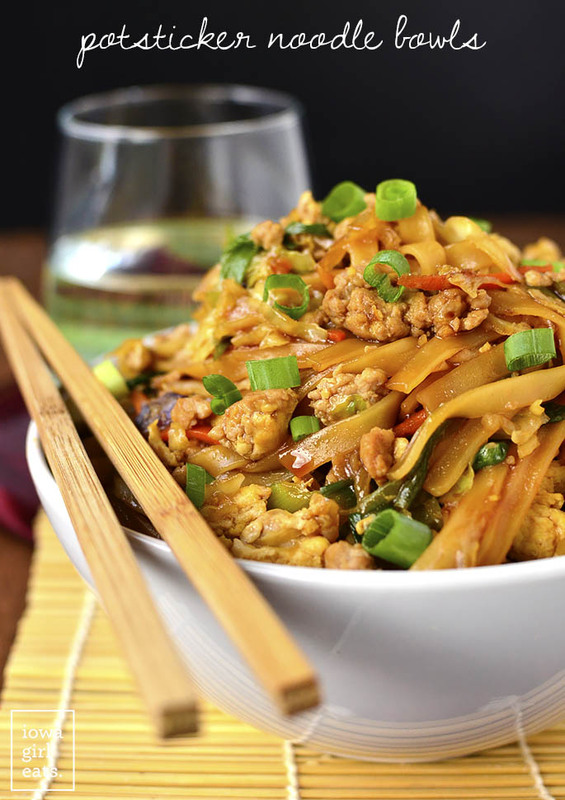 Your stir fry recipes never disappoint us!! Four out of four family members like this – and that’s a BIG deal! Woooooooot – so glad to hear it!! Thanks so much for the feedback! Amazing dish! My husband and I both inhaled it! He is even taking the leftovers to his co-workers tomorrow. Love, love, love your blog! That is music to my ears, Pamela!! Thanks so much for letting me know! 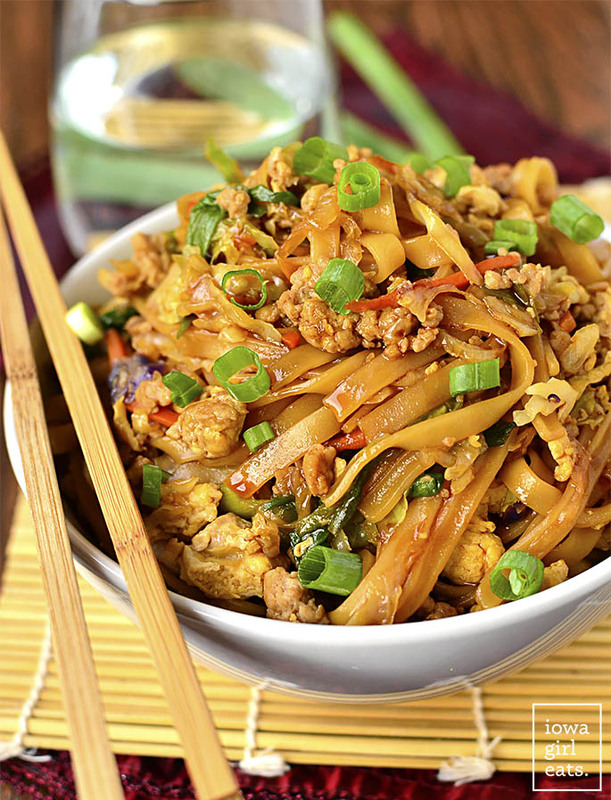 Have you ever done a pad Thai bowl? I would love to try your take on that dish! 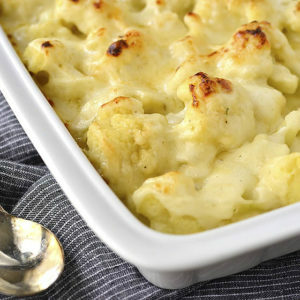 We loved this for dinner tonight! I added a tablespoon of honey to the sauce mixture and just a little chili garlic sauce at the end. This was so good, and I too love potstickers! I would make this again, it was easy and not too much clean up. Thanks for this great recipe! I’m so glad you loved it, Crissy! Great addition of the honey, too! I was so excited to make this dish last week so I went out and bought all the ingredients. I followed this recipe to a T and unfortunately I had to throw it out because it was gross. All it tasted like was soya sauce and salt. Definitely the wrong sauce for this dish! These were great- easy, pretty. and so good!